I think this light table idea may possibly be my most brilliant idea to date. Seriously. It was so much fun and it kept the boys entertained all morning long. That means it kept the boys entertained for hours. I'm not entirely sure how I came up with the idea to use balloons on the light table...but I did. And it was awesome. So if you are looking for the best light table idea for kids ever, then look no further. I know, I know. It's a bold claim, but I am in love with this light table activity. Plus, it uses balloons. What kid doesn't love to play with balloons?! To make this light table activity just that much better, I turned our light table into a sticky light table using contact paper. Okay, actually I didn't have any contact paper on hand at the time, so I had to substitute strips of clear packing tape, which worked just as well. So I taped strips of clear packing tape on the light table, sticky side up. Then I blew up six balloons and placed them on the sticky tape. The boys were surprised to find balloons on the light table and they happily spent a few minutes admiring the glow of the light table through the balloons. But, wait! What's this? The balloons are stuck?! Well, the boys certainly did not expect this twist, but I think that's what made this activity so much fun. The boys had a blast pulling the balloons off the tape and then placing them back on. Over and over. Sometimes they would count the balloons as they put them back onto the light table. Other times they would name the colors of the balloons. They also enjoyed ripping the balloons off of the tape as fast as they could and would laugh hysterically as the balloons popped up into the air, like below. 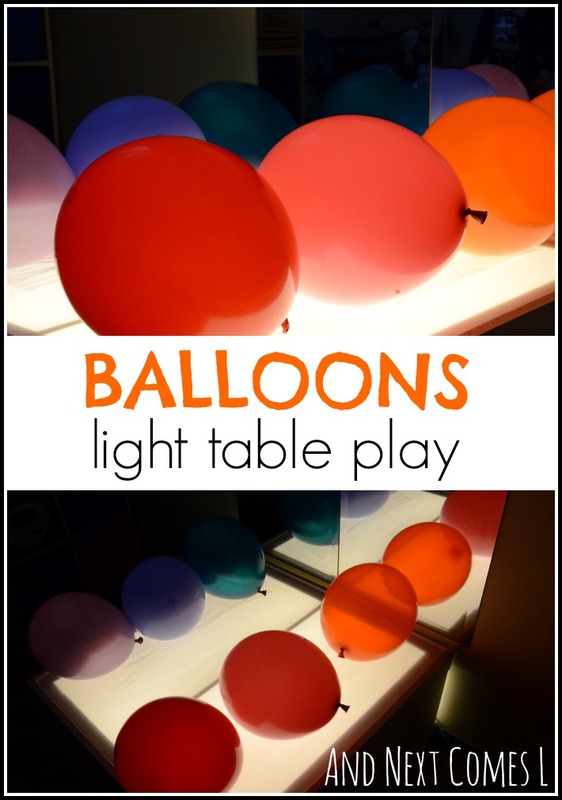 The boys also enjoyed taking the balloons off of the light table one at a time, running over to our Little Tikes basketball hoop, dunking the balloon, and then running it back to put on the light table. Like I mentioned, this light table activity kept the boys busy for an entire morning. It had them counting, naming colors, running, making patterns on the light table, and so much more. It has easily been the best and most enjoyable light table activity we have ever done. This is on my to do list for zack this week that I am off. Love the idea! I also really need to get some mirrors for my light table. Hope Zack enjoys it and I hope you enjoy your week off too! As for the mirrors, I found mine at Walmart. Bought two for $20.